Contact lenses that breathe and keep your eyes healthy. From astigmatism, nearsightedness, farsightedness, and presbyopia, Acuvue contacts can correct a wide range of vision problems. The most convenient way to wear contacts—no solutions and no lens cases. Plus, our exclusive LACREON® Technology permanently embeds a moisture-rich wetting agent into the lens surface so patients get exceptional comfort that won’t blink away. This exclusive technology embeds a moisture-rich wetting agent directly into the lens matrix creating a cushion of moisture, similar to that found in natural tears, that won’t blink away over time. The result is reduced friction and greater end-of-day comfort. 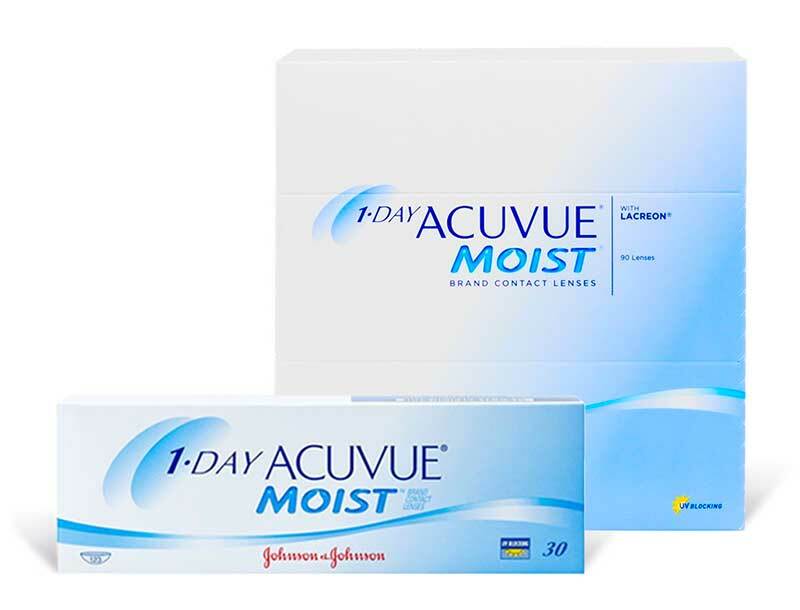 1-DAY ACUVUE® MOIST® Brand helps protect the covered portions of the eye by blocking on average 82% UV-A and 97%† UV-B radiation from the sun. The most convenient way for patients with astigmatism to wear contacts—no solutions and no lens cases. Plus, this contact lens combines our innovative BLINK STABILIZED™ lens design and our exclusive LACREON® Technology for exceptional comfort that won’t blink away. This innovative design features four zones of stability, compared to the single zone of traditional ballast design. Lenses with BLINK STABILIZED™ design realign naturally with every blink, helping to keep them from shifting and rotating. The result is clear, stable vision. 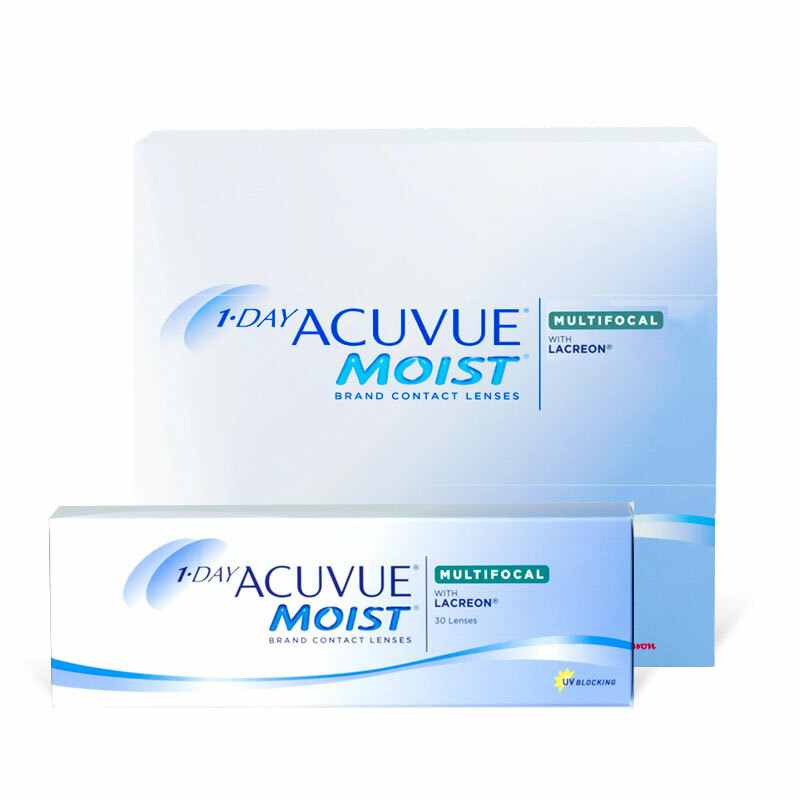 We are able to continue your care and give you a superior experience as your vision evolves into presbyopia with new 1-DAY ACUVUE® MOIST Brand MULTIFOCAL. The only multifocal lenses specifically designed to match the aspheric center-near optical design to the pupil size as it changes across the refractive range and as patients age. Designed to help maintain the natural state of the eye, this is the first and only daily disposable contact lens made with a silicone hydrogel material and the highest volume of wetting agent in the HYDRACLEAR® Technology Family. The most convenient way to wear contacts—no solutions and no lens cases. Perfect for patients who want to wear contacts every day, every now and then or if they suffer from allergies that may cause discomfort. 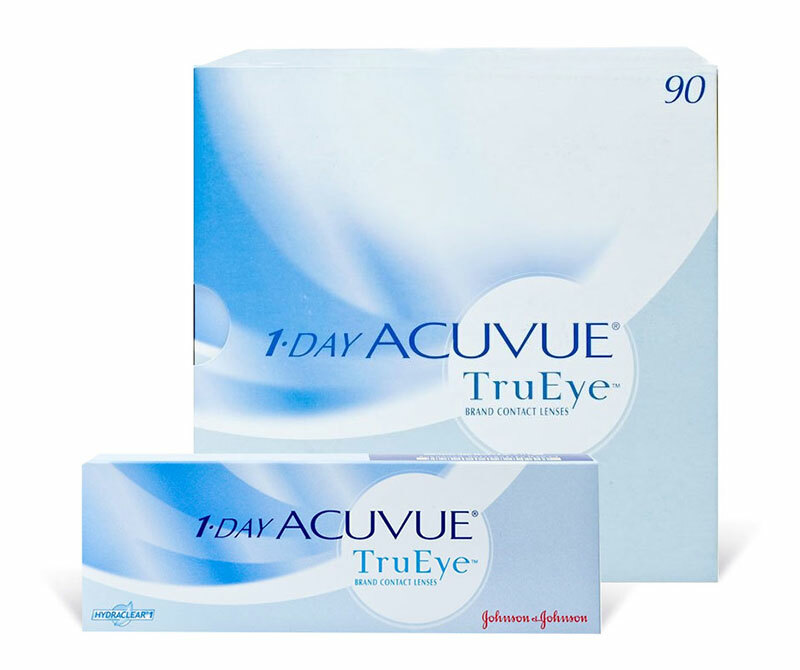 1-DAY ACUVUE® Brand helps protect the covered portions of the eye by blocking on average 82% UV-A and 97%† UV-B radiation from the sun. Innovative new contact lenses enhance the natural beauty of the eye, adding natural-looking definition to the limbal ring. 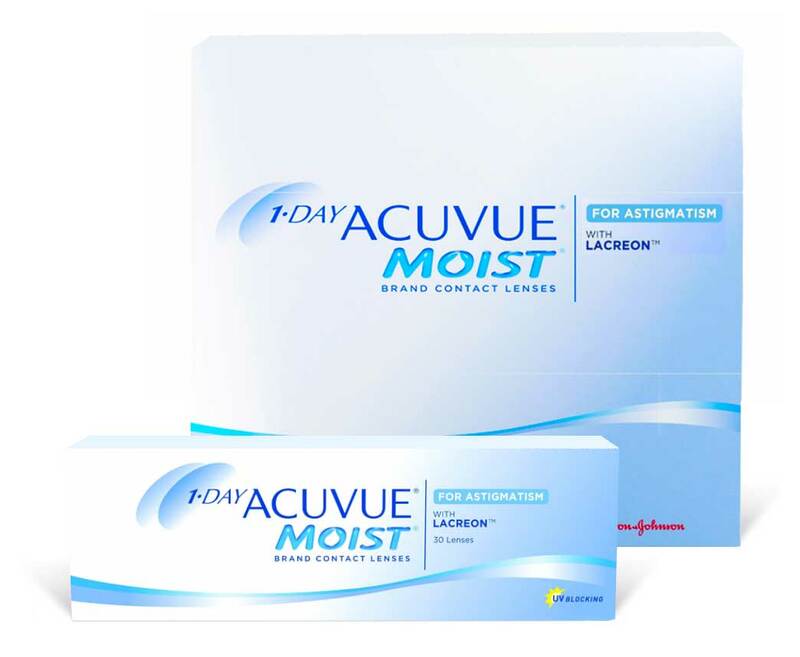 Plus, they’re built on the 1-DAY ACUVUE® MOIST® Brand Contact Lenses with LACREON® Technology platform—the #1 selling daily disposable lens in the world. Inspired by your natural iris, 1-DAY ACUVUE® DEFINE with LACREON provides a high standard of beauty to give you the natural radiance you seek. The sophisticated pattern adds natural texture to create depth to the iris while its varying translucency blends in with the iris to highlight depth, which provides an illusion of bigger, sparkling eyes. 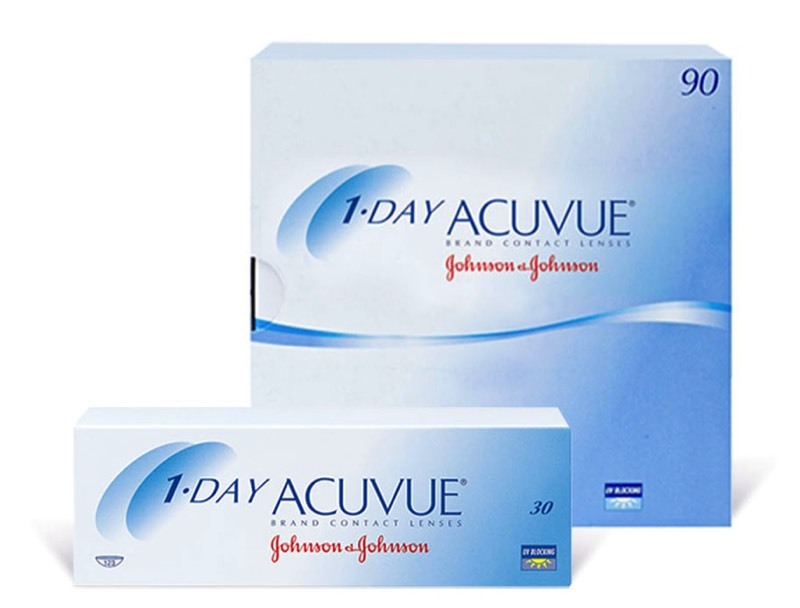 1-Day Acuvue Define lenses are the first daily disposable lenses to enhance your beauty in a natural, subtle way. It makes your eyes look bigger, brighter, and more beautiful. It features a unique and defined circular ring that enhances and darkens the iris (the colored part of your eye) therefore making your eyes look bigger, brighter, and more defined. Acuvue Define Accent Style feature a dark ring which overlays the limbus (boundary) between the iris and sclera. The ring is designed with a diamter slightly larger than the average iris, making your eyes look larger and enhancing the definition and natural beauty of your eye. Acuvue Define Vivid Brown Style feature brown spokes delicately designed to enhance and define the natural pattern of your iris. Your eyes will look more alive and add vibrance and expression to your look. 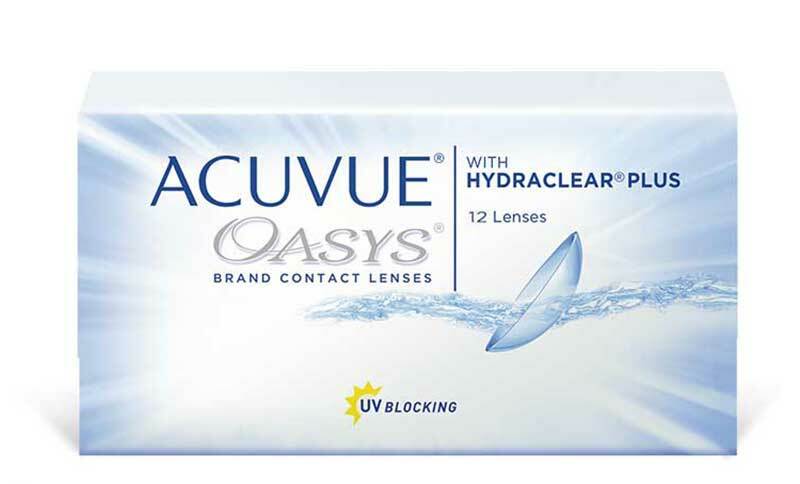 Acuvue's top of the line contact lens features second generation HYDRACLEAR® PLUS Technology to provide comfort all day long—even in challenging environments that can make eyes feel tired and dry. Our second-generation comfort technology balances the increased oxygen transmissibility of a silicone hydrogel material (98% of available oxygen to the eye) with a higher volume of wetting agent to create greater lubricity. The result is an ultra-smooth, more wettable contact lens that’s especially suited for patients living and working in challenging environments. Acuvue's top of the line astigmatism contact lens combines our BLINK STABILIZED™ lens design and the exceptional comfort of HYDRACLEAR® PLUS Technology to form a contact lens that’s consistently clear and remarkably comfortable—especially for patients with an active lifestyle. Acuvue's second-generation comfort technology balances the increased oxygen transmissibility of a silicone hydrogel material (98% of available oxygen to the eye) with a higher volume of wetting agent to create greater lubricity. The result is an ultra-smooth, more wettable contact lens that’s especially suited for patients living and working in challenging environments. 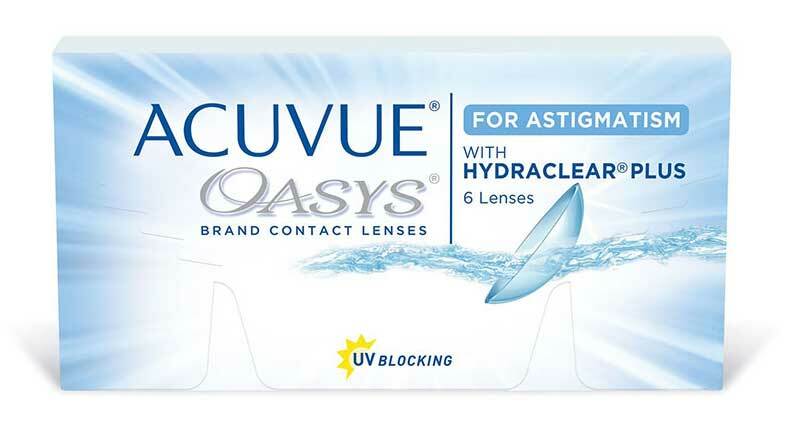 ACUVUE® OASYS® Brand for ASTIGMATISM helps protect the covered portions of the eye by blocking on average 96.1% UV-A and 99.9%† UV-B radiation from the sun. This next-generation multifocal contact lens combines the unique optical design of STEREO PRECISION TECHNOLOGY™ and the exceptional comfort of HYDRACLEAR® PLUS Technology. The result is balanced vision near, far and in-between, along with remarkable comfort—even in challenging environments that can make eyes feel tired and dry. This unique multifocal design brings together the best elements of aspheric progressive and ring lens designs, while limiting the drawbacks. It works with the eye’s natural function to provide balanced vision near, far and in between, across variable lighting conditions. 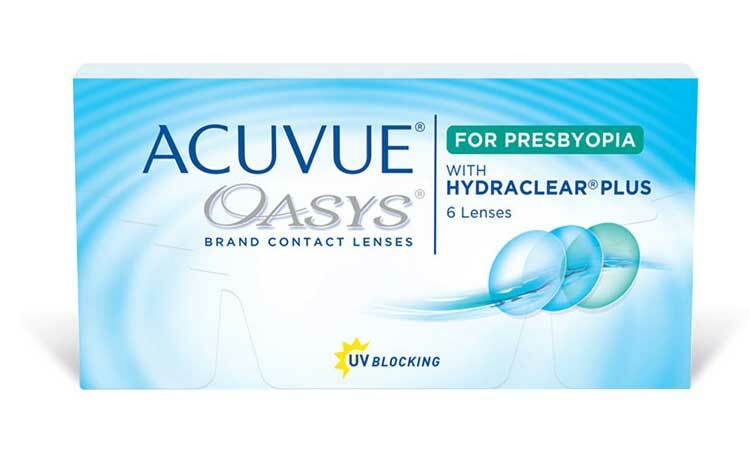 ACUVUE® OASYS® Brand for PRESBYOPIA helps protect the covered portions of the eye by blocking on average 96.1% UV-A and 99.9%† UV-B radiation from the sun.